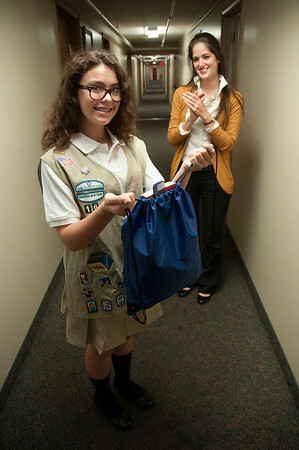 James Neiss/staff photographerNiagara Falls, NY - Teresa Buchner, 13, is a girl scout going for silver award. Her goal is to give homeless kids a dictionary and supplies for success in school through a program she created called "My Bag of Courage." Community Missions of Niagara Frontier Events & Volunteer Manager Andrea Gray applauded her efforts.